Credit: http://www.noterror.eu. All rights reserved. British Prime Minister David Cameron’s announcement in Birmingham last week of a new five-year plan to deal with extremism comes hard on the heels of the UK Counter-Terrorism and Security Act (or CTSA), which came into force earlier this year in direct response to intelligence that hundreds of British citizens have been travelling to Syria to fight for ISIS or live in its ‘Islamic State.’ These policy developments shift the focus of the current UK government’s counter-radicalisation efforts decisively to ‘non-violent extremism’ which, it argues, leads directly to terrorist violence. This focus has potentially far-reaching implications for the exercise of Muslim dissent in liberal societies, such as the right to hold beliefs which may challenge the legitimacy of state power, or even confront dominant forms of Islamic authority, but which fall short of advocating violence. It is a domestic measure which is one component of a wider strategy to foster Muslim moderation. Soft power is another, long exercised through Western support for state-sponsored centres of traditional Islamic learning abroad such as Al Azhar in Egypt. What links both of these components together but is rarely acknowledged is the growing constriction of the global public space for Muslim free expression. In expanding the focus of the state’s enforcement powers from monitoring the planning and execution of specific terrorist acts to scrutinizing any opinions it deems ‘extremist’ in everyday environments, Cameron’s anti-extremism strategy also marks a significant departure from previous governments in its unprecedented degree of intervention into the policing of ideas in the UK. Stifling dissent in these ways—through what Cameron has called the need for a “muscular” rather than “misguided” liberalism—can have paradoxical implications which allow ISIS to subvert the role of the ‘freedom fighter.’ This subversion lies at the heart of the radicalisation conundrum and can help to explain why jihadists can attract young Muslims to their cause. Cameron’s Birmingham speech rightly identified the problem of the allure which ‘makes celebrities of violent murderers,’ but suppressing rather than re-channelling the impulses that lead impressionable minds to make such dangerously mistaken choices may not, in the end, defuse the potency of this attraction. Prior to his speech, the CTSA had already legally codified the ‘Prevent’ strategy which has been implemented by British governments in various ways for over a decade. As its name suggests, this strategy has aimed to prevent citizens from “being drawn into terrorism.” Further guidance relating to the CTSA’s ‘Prevent’ provisions was issued in July, including the placement of a controversial statutory duty on all higher education institutions to monitor and report instances of non-violent extremism. Will these measures cause people to turn away from heading to the Middle East to take part in the brutal violence that ISIS and other jihadi outfits mete out? Or will they lead to greater levels of distrust among British Muslims at a time when they are already an increasingly stigmatised minority? The early signs suggest that the latter outcome is more likely, the latest example being the defection to ISIS in Syria of three generations of a Muslim family of twelve from Luton. The steady line of foreign jihadis into the region is matched only by the rising wave of anger among many British Muslims at both ISIS’s actions and the government’s collective focus on Muslim citizens as suspect communities who may, at any moment, subvert ‘British values,’ or at least not defend them robustly enough. While the West may see the Middle East as the arena at the heart of the jihadi problem, Western policies should also be of concern to Middle Eastern states and societies because of their knock-on effects on the region. However counter-intuitive it may appear to Western governments, the solution to extremism in the longer-term lies in developing strategies that enable rather than limit the public space for Muslim dissent in liberal societies. This is something that has not been given enough attention since 9/11, with counter-radicalisation strategies focusing on narrowing civil liberties and creating the chimera of state-endorsed ‘moderate Muslims’ to take the battle to the jihadists—too often seen as politically complicit and un-free. In what was perhaps an oblique critique of New Labour’s approach to Muslim engagement in his Birmingham speech, Cameron criticised groups who claim to ‘represent’ Muslims but which in fact represent small, sectional interests. However, his own policy seems to be supported by an equally narrow band of ‘representatives’ such as the Quilliam Foundation’s chairman Maajid Nawaz, who tweeted that he had been consulted about the Prime Minister’s speech. This suggests that, despite the rhetoric, not much of substance has changed which might help to heal divisions among Muslim communities. In the past, these tensions have been exacerbated by the myopic, self-serving party politics of both Labour and the Conservatives who have played one group off against another. ISIS’s appeal to young Muslims in the West is driven by a complex set of factors—religious, social, poltical and personal. Studies of ‘radicalisation’—now a well-funded industry—have been useful in mapping the ever-shifting landscape of terror networks (especially online), but they still lack the robustness to predict the recruitment processes of jihadist groups. Not surprisingly then, in the wake of the beach massacre of mainly British tourists in Tunisia in June 2015, Cameron labelled his approach to tackling Islamist extremism as “full spectrum”—intended to cover everything from the CTSA to the revelation that British pilots are involved in the bombing campaign against ISIS in Iraq despite parliamentary opposition. The problem of shaping effective policy interventions against groups such as ISIS is not only that such an approach is built on assumptions about the nature of the threat which are open-ended, vague and diffuse, but also that its component parts are in tension with one another. For example, the suppression of the right to non-violent dissent implied by the CTSA and Cameron’s five-year plan is grafted onto an equally vague definition of non-violent extremism which is supposed to contravene ‘British values’ such as the ‘the rule of law.’ This suggests a very wide view of what might constitute state subversion which does little to capture the specific kind of extremism that might lead to jihadi violence. In Western policy circles, the issue of freedom of expression has largely been treated separately from that of socially-engineered Muslim moderation. But ‘policing freedom’ and ‘fostering moderation’ are two sides of the same counter-radicalisation coin, spinning out of sync and shot through with contradictions. In effect, Muslims are being asked to do three mutually incompatible things. First, to be more liberal than militants on matters of social mores and the permissibility of violence. Second, to be less liberal than their fellow non-Muslim citizens when airing non-violent dissent. And third, to be more authoritarian than decentralised global jihadists when asked to step into line behind the centralising fatwas of orthodox religious authorities such as those represented by Al Azhar. It is little wonder that appeals to bolster such traditional centres of Islamic authority are found wanting, particularly as they themselves have long been in a legitimacy crisis, morally compromised by the political expediencies of the authoritarian governments who prop them up. 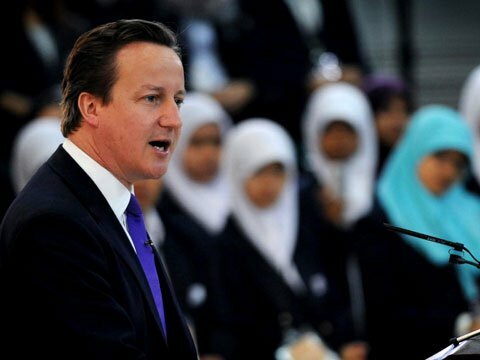 These confused signals can lead to forms of alienation among young Muslims that are quite separate from the causes Cameron detailed in his speech, though by turning his attention to social integration (however clumsily) his five-year plan at least has the virtue of trying to deal head-on with some of the difficulties Muslims face in being accepted into British society. As he pointed out, brutal excesses of cultural relativism in the name of Islam—such as the growth of female genital mutilation (FGM) in the UK—must be tackled as abuses of fundamental freedoms. The debate about ‘extremist’ versus ‘moderate’ Muslims has always been underpinned by obsessions about the need to strengthen ‘true’ or ‘authentic’ forms of Islam. Centralising religious authority is needed, it is argued, to face the threats facilitated by a fragmented globalised environment which allows anyone to claim religious legitimacy. But it makes little sense to focus on the ‘crisis of authority’, which conservative Muslim moderates faced long before 9/11, without tying such appeals to the ways in which these scholars and the Western governments who support them are also closing down the space for Muslim free expression, even as they seek to counter extremism at home and abroad. Until these two worlds are seen as co-dependent, Western policymakers will struggle to counter the perennial appeal of jihadists. This is the undertow that perpetually threatens to derail attempts to tackle jihadism, however well-meaning. The attraction of ISIS for some young Western Muslims lies precisely in how they present themselves as free thinkers who have come to liberate minds colonised by Western oppressors and their subordinate Muslim allies.